Record-low rain numbers have put much of California in a major dry spell. 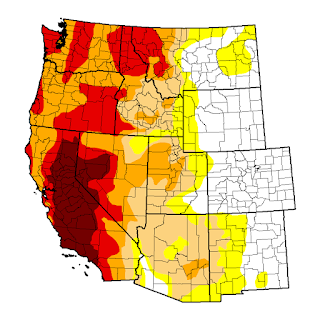 California continues to deal with its ongoing drought. Water managers and farmers are adapting their practices to help conserve water and reduce economic loss in the state. Temperatures in California were warmer than average in the south, gradually transitioning to cooler than average northwards. 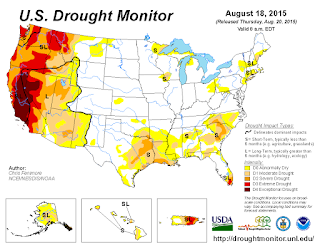 The only precipitation that fell during the period was in south and east Nevada. During the next 6-10 days, the probability of cooler than normal temperatures are high in the Ohio and Tennessee River Valley’s extending into the Great Lakes and Midwest. Chances are likely that the rest of the country will experience warmer than normal temperatures, especially in the Northeast, Southeast, and Southwest. Over the same period, precipitation associated with the large system centered over Wisconsin will move through the Great Lakes area. Further south, the precipitation will slowly move eastward and dissipate as the low pressure moves into Canada. Another, less powerful and dryer system will follow producing the heaviest precipitation in the Midwest. Ridging continues to hold its grip in the West while monsoonal precipitation may bring light drought relief in the Southwest.